Raise your hand if you’ve ever felt a special sense of pride when preparing a meal that included fresh, wild game. There is just something satisfying about knowing exactly where your meat came from that makes wild game meals even more appealing – and – appetizing! Oftentimes, there is an exciting story to accompany the game that’s been prepared. Delicious food paired with great conversation, what more could you ask for? On Wild Game Wednesday, we take a moment to recognize one of the most important reasons people take to the woods and fields to hunt: to fill their freezers with types of fresh, organic meat. These weekly posts include delicious, easy and in-season wild game recipes from the Pennsylvania Game Commission’s Game Cookbook that you and your family can prepare. For all our goose hunters out there, this one is for you! Let us know if you try this recipe. 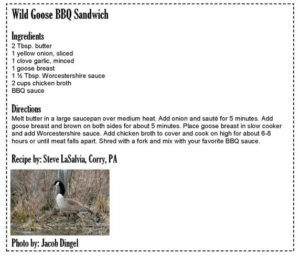 If you are interested in more wild game recipes submitted by people from around Pennsylvania, visit www.theoutdoorshop.state.pa.us/FBG/ to purchase the second edition of the cookbook for less than $10!